It's not often that you get to see, in real time, how some of the analysts you follow are performing. With our CAPS system, that's now possible. Even more rare is the ability to get real-time updates on what analysts are buying and selling -- all for free. But that's exactly what we offer at The Motley Fool, through our Real-Money Stock Picking program. Eleven of the Fool's in-house analysts are making real purchases with the Fool's money. I've highlighted five of those buys made in March, and the reasoning behind them. At the end, I'll offer up access to a special free report on one company Warren Buffett wishes he could buy... but can't. When Superstorm Sandy hit last year, millions of Americans were left without power for days. It offered a humbling reminder of how reliant so many of us are on the nation's power grid. Though my wife and I live in the Midwest and avoided the worst of the storm, we have family that lives in the Northeast and was right in the middle of it. One prescient uncle in particular became a neighborhood hero when his not one but two generators were lent out to neighbors when they were needed. It's that type of thinking that led analyst Jim Mueller to buy shares of Generac Holdings . The company, which makes generators of all sizes, has been around for nearly 50 years, and has a 70% market share of home standby generators. As Jim rightly points out, our nation's electrical grid isn't getting any younger; and even though improvements will surely be made, it won't be without delays and political grandstanding. As it is, outages are becoming all the more commonplace, meaning that Generac's products could be in increasing demand. 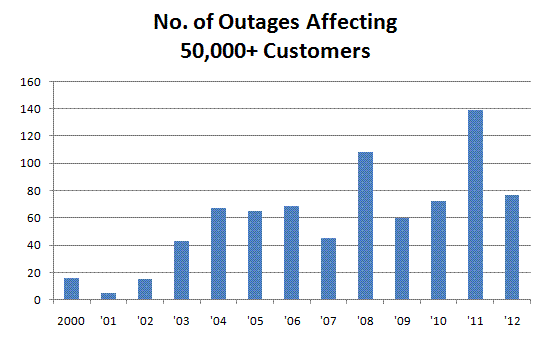 Source: Electric Disturbance Event annual reports, Office of Electricity Delivery & Energy Reliability, DOE. The other energy company on our analysts' radar was Apache , a natural gas and crude oil company. Fool analyst Paul Chi, after carefully considering what he heard from Apache's analyst day presentations, thinks now is the time to buy shares. Specifically, Paul is excited that the company has signaled, in no uncertain terms, that it is going to start drilling more wells across the swath of its balanced worldwide portfolio. This build-out will help the company achieve its goal of 1 million barrels of oil per day by 2016. While I think that's encouraging -- as is the fact that the company is trading for a cheap seven times forward earnings -- I tend to stay away from investments that are so prone to commodity price swings. Along with the energy sector, our analysts were busy buying up shares of bank stocks as well. But if you're looking for big-name banks, you're out of luck. Our analysts are digging much deeper to find their favorites. Fool analyst Anand Chokkavelu recently discussed why he's buying shares of Missouri-based Great Southern Bancorp . When it comes to small banks, it can be difficult to measure soft variables like company culture and service, so Anand instead focuses on "banks that have strong operations, conservative lending, good dividends, and low price tags." Currently, Great Southern only has 0.9% of its loans non-performing, signaling strong, smart, conservative lending practices. With a 2.9% dividend and a P/E ratio of 7.7, Great Southern simply fills out what Anand is looking for. And Anand wasn't alone in looking for bank deals. Foolish counterpart Jim Royal believes that shares of TFS Financial could double in the not-so-distant future. Jim likes to focus on stocks in special situations, and he sees just that in TFS. Specifically, the company simply has tons of cash on hand -- cash that it intends to give back to investors. In fact, as Jim states, "TFS has so much capital that it could buy every share that trades publicly!" Though there are some hurdles to clear before it does so, Jim believes sizable share repurchases and dividends are in the offing. As for me, trying to understand the complex balance sheets of banks is beyond my specialty -- though that shouldn't stop you from diving in if it interests you. The final stock for the month also comes from Jim Royal. This time, he purchased shares of Ryman Hospitality . Ryman focuses almost exclusively on providing hotels that allow for large conventions as well. The special situation here is that, after converting from a REIT earlier this year, Ryman is planning on a special dividend as large as $2 per share and a buyback before the end of the year. It sounds like a good deal to me, but I'm more of a buy-to-hold investor, and this seems like too short-term a trade for me. The price of becoming the world's greatest investor is that Warren Buffett can no longer make many of the types of investments that made him rich in the first place. Find out about one such opportunity in "The Stock Buffett Wishes He Could Buy." The free report details a sector of the economy Buffett's heavily invested in right now and exactly why he can't buy one attractive company in that sector. Click here to keep reading. The article 5 "Buy Now" Stocks From Motley Fool Analysts originally appeared on Fool.com. Fool contributor Brian Stoffel has no position in any stocks mentioned. The Motley Fool owns shares of Apache, Generac Holdings, Great Southern Bancorp, Ryman Hospitality Properties, and TFS Financial. Try any of our Foolish newsletter services free for 30 days. We Fools may not all hold the same opinions, but we all believe that considering a diverse range of insights makes us better investors. The Motley Fool has a disclosure policy.